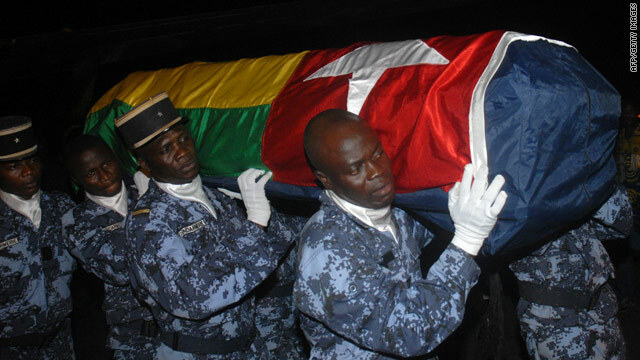 Togolese gendarmes carry the coffin of one of the shooting victims. (CNN) -- Togo captain Emmanuel Adebayor has labeled as "outrageous" the controversial decision to ban his side from the next two Africa Cup of Nations. Togo, who pulled out of this year's finals after a terror attack on their team bus left three dead, were hit with the shock ban and a $50,000 fine by the Confederation of Africa Football (CAF) on Saturday. Manchester City star Adebayor reacted furiously to the news and claimed that CAF's Cameroonian president Issa Hayatou had "completely betrayed" the Togo squad and called for him to quit. He told L'Equipe: "Mr Hayatou has served Africa extensively, but now he must escape. This decision is outrageous." "They do not care about the voice of the world. It was our head of state (Faure Gnassingbe) who sent us to the African Nations Cup to defend the colors of our country. "He said the threat surrounding our squad had not gone and told us to return to our country. We are only ambassadors. We were obliged to return, and there was nothing we could do." Togo's French coach, Hubert Velud, called on FIFA president and UEFA chief Michel Platini to intervene. "I am curious to know if Blatter and Platini will endorse this decision," he said. "If they let this go, it is the gateway to completely dysfunctional football. I officially launched an appeal to international bodies to see their reaction." Three people were killed in the attack, which took place while Togo traveled to the team hotel two days before their opening match earlier this month. Communications chief Stanislas Ocloo and assistant coach Abalo Amnalete were shot dead and goalkeeper, Kodjovi Obilale, was among the injured. Togo wanted to continue despite the attack but quit on their national government's orders. The attack raised fears about security for the World Cup, which takes place in South Africa later this year. CAF has decided the decision to recall the team was political interference, leading to Saturday's suspension for the tournaments in 2012 and 2014. CAF said in a statement: "The executive committee and its president renewed their sincere condolences to the families of victims involved in this tragic terrorist attack which happened January 8, 2010. "The attack was condemned by CAF and also a total support was given to the Togolese team. "At that time, CAF said they have understood perfectly the decision of players not to participate in the competition. "Meanwhile, following a decision taken by players to participate in the competition, the Togolese government decided to call back their national team. "The decision taken by the political authorities is infringing CAF and CAN (African Nations Cup) regulations. "Therefore, a decision has been taken to suspend the Togo national team for the next two editions of Africa Cup of Nations, with a fine of U.S. dollars 50,000 handed to the Togolese national football association, in conformity with article 78 of Africa Cup of Nations Angola 2010." 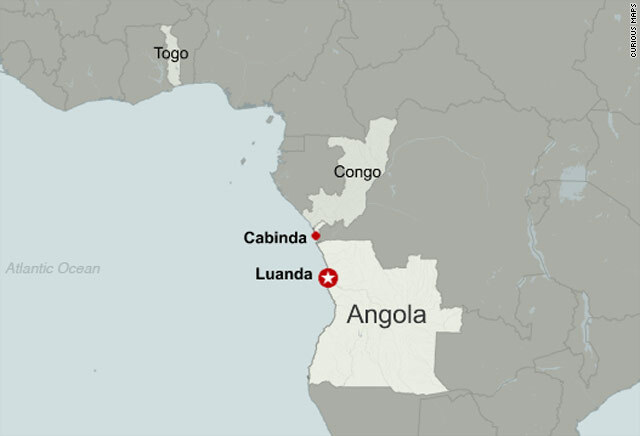 Two men arrested over the attack were said to be members of the Forces for Liberation of the State of Cabinda, an armed wing of a separatist group that has claimed responsibility for the attack and has threatened to strike again. Cabinda is a disputed oil-rich enclave in the Democratic Republic of the Congo and was the site of eight matches in the African Cup of Nations tournament. The Africa Cup of Nations tournament is one of the biggest sporting events in the world this year, and Angola's first since a 2002 peace deal ended decades of civil war in the southern African country.